The tiny-yet-menacing follow-up to Crate's Blackheart Series Little Giant 5, the BH1H "Killer Ant" is the first truly attainable, boutique-quality, fractional tube amp. Boasting Class A, single-ended circuitry, this lil' bugger delivers the tasty, touch-responsive tube tone of a classic monster, but growls at volumes more suitable for apartment dwellers and home studio recording. Fiendishly designed on a beer-stained cocktail napkin, prototyped, then "brought to life and mercilessly experimented on" in a one-car garage down in the Lone Star State, the Killer Ant is engineered to the same exacting standards as the Little Giant 5. And like its big bro, this new tone-drone features completely overbuilt component specs, from one-watt resistors in the signal path to a double-sided PCB with two-ounce traces. The Killer Ant embraces a fully classic, all-tube circuit; but, instead of a high power tube output section, it sports a clever, all-tube power block pumping out a mere fraction of one watt. The result is a Bic-flickin' arena rock tone at a bedroom level, so no more pissed off neighbors, bitchy wives or girlfriends, or cryin' babies that have just been scared awake by your beast. 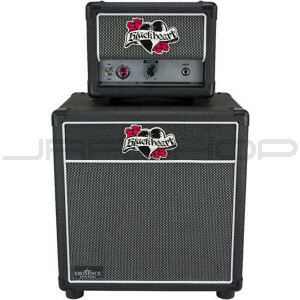 Blackheart's new slightly-larger-than-palm-sized BH110 "Killer Cab" features a single 10-inch Eminence driver co-designed by Pyotr Belov that is perfectly paired to pull huge body out of the amplifier. Four-, eight- and 16-ohm extension speaker jacks further allow guitarists to hook the Ant into virtually any cab they like, including a 4X12. Although the cabinet is "itsy-bitsy," it's built to take a good beating with 15-ply (18mm), void-free wood expertly covered in durable black tolex. Final touches include distinctive white piping accents, salt and pepper cloth-covered front baffle, and the rakish, tattoo-like charm of the Blackheart Engineering logo.